On Thursday January 4, 2018, in conjunction with Toronto Fringe, we held an #UrgentExchange entitled "DESIRING DIVERSITY, but who can afford to work for free?" 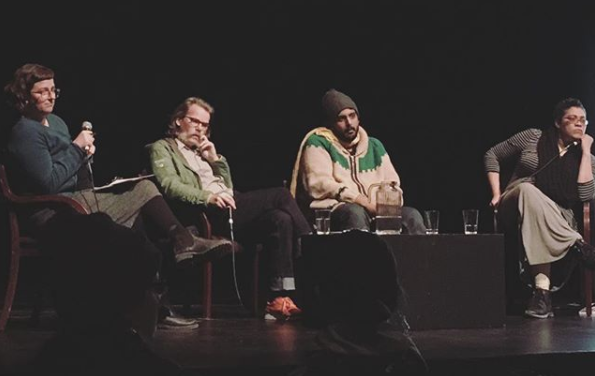 The desire to do work with more diversity, inclusivity and accessibility is strong in Toronto’s independent performance community but can our communities be truly inclusive if financial obligations keep many artists out of our rehearsal halls? Who has the ability to ride the financial risk of a career in the arts? What can creators with financial privilege do to shift the systemic classism in the arts? Our Executive Director, Kristina Lemieux was joined by speakers: Donna-Michelle St. Bernard, Jivesh Parasram, Michael Maranda, as well as a video instigation by Shaista Latif. This was a big one. If artists didn’t have to devote time and energy to figuring out where their rent money was going to come from (or to concealing that struggle), how much richer would their creative output be? If theatre-goers didn’t have to think about seeing a show as a financial risk (what if the show is terrible?) they would see more theatre - period. Our most liked and retweeted comment of the night was from Donna-Michelle: “Why are we not encouraging people to find adjacent careers in ways that support art, and not stigmatizing them as failed artists?” Jiv said something that’s helped him find balance has been finding the right “day job” (throwback to our July #UrgentExchange on work/work balance) For many artists, that is working in a production or arts management role, but the stigma that you can’t both be an artist AND and an administrator is REAL. And we need to change that. "The idea that my work is adjudicated by someone who doesn't share my values is abhorrent to me," Donna-Michelle said. She encouraged all eligible theatre professionals to sit on peer juries and to consider this a public service, one that we all need to do for our community. In her video instigation, Shaista Latif called out privileged white artists who seek out POC artists as “consultants” without making them integral parts of their projects (and she told POC artists to just SAY NO, even if it’s hard to turn down the money). So, privileged white artists, if you’re looking for a takeaway, that’s one. More takeaways: Jiv says if you are lucky enough to have leisure time, spend it advocating for change. Donna-Michelle says DO NOT push into spaces that aren’t for you, just because you are used to being welcome. There’s a balance between knowing your worth and being paid accordingly, and working within the financial constraints of the indie community. Leah-Simone Bowen, the Theatre Officer at the Toronto Arts Council, spoke from the audience and said what we need is for people to be more honest with each other. She has seen people walk away from projects because they demanded more money, but the organization simply had nothing left to give. Jiv said that we need to look beyond the Equity agreements for insight into how to pay artists properly. Also: when you are posting a job, DISCLOSE THE SALARY. Every time. Don’t waste people’s time.